We are currently in our typical winter weather pattern where like today a major low-pressure system (cold front) is sweeping through Central Florida resulting in significant rainfall and the chance of sever weather. As these fronts pass through conditions on the water become unsafe for fishing. On the first post-frontal day, high-pressure settles in bring high winds, cold temperatures and high-pressure making fishing conditions very challenging again. 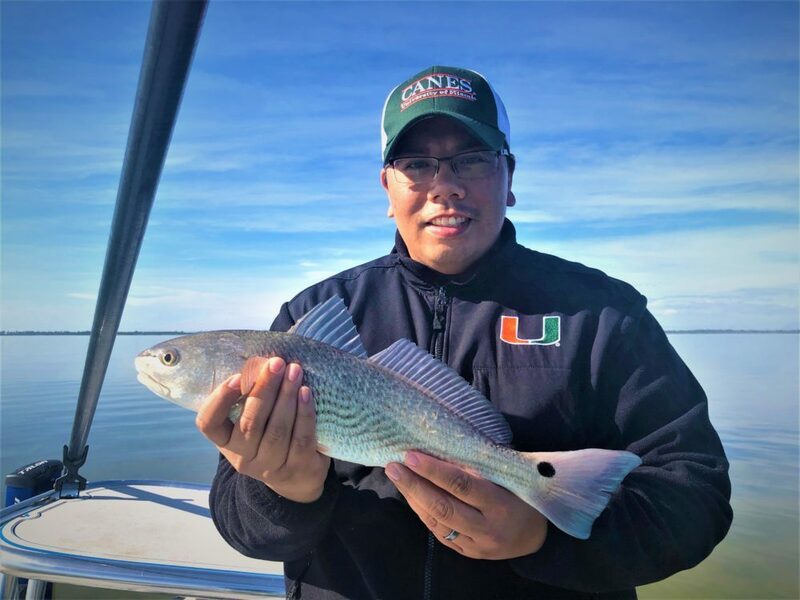 As the high-pressure system moves out into the Atlantic (day three) fishing conditions improve and the temperatures begin to warm up with the following two to three days proving to be the best days to fish. 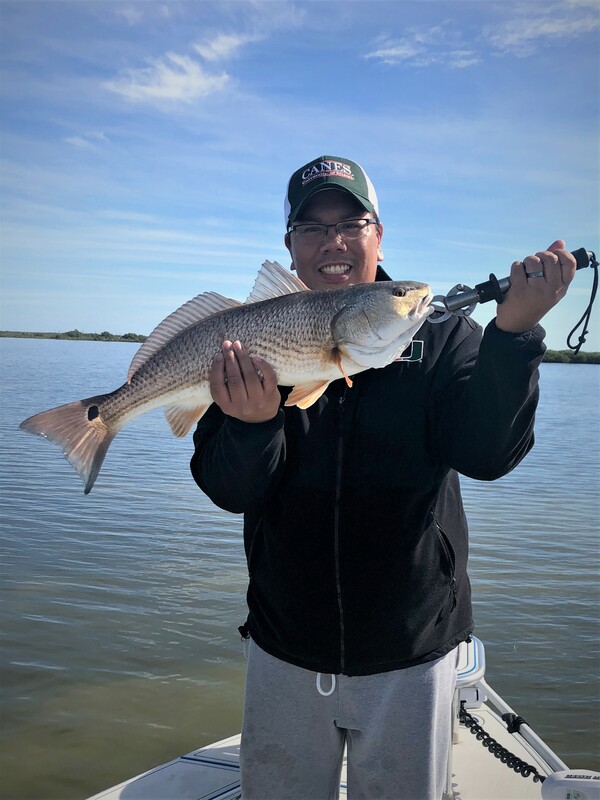 When scheduling a fishing trip during the winter in Central Florida, it is a hit or miss scenario in most cases, so sometimes it is best to simply take a mental health day on the water when the conditions are right. Well folks, yesterday was a perfect prefrontal day with falling barometric pressure. It was my first charter since my accident and I must tell you it felt great to be back on the water again. On pre-frontal days the winds turn westerly and lay down. The skies are typically clear, and the water is glassy. This was the case yesterday where I was honored to share my first day back on the water with clients Cliff, Matthew and Eugenio from Orlando. We launch at Bairs Cove on the Merritt Island Wildlife Refuge at 9am and headed north into the Mosquito Lagoon. Surprisingly, we soon found gorgeous water conditions and a large number of redfish schools up shallow on the flats. As usual for our winter low water conditions, the schools were very spooky and hard to approach, but we still managed several very respectable upper slot fish. The fish we found were in between 12 and 18 inches of water and they were not showing themselves which made it even more challenging to locate and present a lure to them. All in all, it was a great day on the water with good clients, and I have to say it again, it was great to be back on the Mosquito Lagoon.